With the roaring success of ICMCS 2011 and ICMCS 2015, Amity school of communication has again opened its doors of welcoming media scholars and experts for its 3rd edition of International conference on Media and Communication Studies from 2nd March to 4th March of 2017. It is my pleasure to share with you that there were more than 150 participants from various parts of the world, including India, South Africa, Jordan, France, Canada, Iran, UAE. The conference had its relevance in discussing the theme of “Contemporary Media theories and practices” in the age of digital convergence, big data and new media shifts. The conference was inaugurated on 2nd March 2017. Hon’ VC, AUR, Prof. SK Dubey welcomed the gathering with his inspiring words of wisdom. He was critical on media content in 24X7 news trend and also pointed out the importance of media in contemporary society. Prof. Sanjeev Bhanawat, Head, Center for media and communication studies, Rajasthan University during his keynote address stressed on the roles and responsibilities of journalist in bringing objectivity in news. The Guest of Honor, Dr Faizal Malik, Head, ASCO AUD, talked on the significance of public opinion, digitisation and digitalisation in the age of media convergence. His thoughts were enlightening and informative for young and fresh minds. The Chief Guest of inaugural session: Shri. Sunny Sebastian, Former vice chancellor Haridev Joshi University, & currently associated with Rajasthan Patrika, as Deputy News Editor, took forward the theme with paving his views on media organisations and the need of transparency in journalism. He was also curious about the future of media education and role of journalist in the age of digital convergence. Prof. Manish Verma, Director, ASCO, AUR delivered vote of thanks and stressed on the need for International deliberation and discussion for understanding the shifts in contemporary media theories and practices. The book of abstracts was released during inauguration by the dignitaries. The first day found two engaging technical sessions on Dynamics of Media, Content and User Participation. The sessions were chaired by Dr Faizal Malik and Dr Monica Verma respectively. an outcome assuring that the topic of our conference found impactful and relevant. The day came to an end with the soulful cultural eve, where delegates from various places enjoyed not only the contemporary dance performances, but our students mesmerised the audience with the folk dance performance. Day 2 of the conference started with Technical Session on Digital Media and Audience, which was chaired by Dr Neeraj Khatri (Head, Communication Dept, JERC University, Jaipur) followed by a panel discussion on “Issues of ethics, objectivity and fairness in contemporary media theory and practices". Mr. Rajan Mahan - Resident Editor at NDTV Jaipur, Rajasthan, Mr. Raman Nada, Snr. Journalist, & Former media advisor to the Governor of Rajasthan, Mr. Mahesh Sharma, Resident Editor, Dainik Navjyoti, and Dr. O.P. Yadav, Snr. Journalist DD. The eminent panel discussed on the various issues relating to the theme : Issues of ethics, objectivity and fairness in contemporary media theory and practices. Mr. Mahesh Sharma, in his talk noted: “ Ethics and objectives of media should be focused more on national development and, it should be oriented towards readers not advertisers”. He also commented on the power of social media that “ it makes issues more trivial and real problem of people is not highlighted”. Mr Raman Nanda, Specifically noted that “ the Corporate reality and business reality is also an important part of Media which cannot be totally ignored”. “The concept of who alters age media and the message is now changed”, It is a fundamental issue & Cannot be resolved by any individual alone, Constraints will always be there but we must introspect’. Mr. OP YADAV, said: That despite of media is considered as a 4th pillar of democracy, news has a mission and business is dominating media content. Advertisers now decide where, when and how news will be displayed. Cross media ownership is effecting new policies making decisions. Media is now slowly becoming a party. As per his views market or viewers actually want to see more of Entertainment based news rather than conventional news. He also noted that everyone is connected, Policies needs to be re-framed”. Later, two more technical sessions were held on Day 2 on Development Communication in Digital Age chaired by Dr. Vikas Dogra (Head, Mass Communication Department, HPU, Shimla) and Cinema and Visual Studies chaired by Mr. Kamjeet Singh, Producer, Centre for Media, Punjabi University. The Day 3 started with technical session on the Role of Social Media session chaired by Dr. Tanushree Mukherjee (AP, ASCO AUR). The session discussed important and relevant issues in contemporary media and practices. Yadam Institute of Research, India’s Human Rights and Duties Research Centre organized its 2nd International Congress on Human Rights and Duties on 10th Dec, 2016 in New Delhi. The Conference had very selected academicians, research scholars and missionaries from all around the world to share their valuable insights on the different themes related to Human Rights and Duties. Dr. Tanushree Mukherjee, Assistant Professor, Amity School of Communication was invited by the institute as a delegate to speak on her selected paper titled, “Public Relations: A Path Towards Inclusive Growth: A Case Study of CSR Initiative of an NGO towards Inclusive Growth” . She was awarded a medal along with a certificate for her presentation. Dr. Mukherjee also received the very prestigious “Empowered Women” Trophy on the occasion in the category of best Research Work done in the Eastern Region. Public Relations Society of India organized its 38th All India Public Relations Conference on the theme "Young India and Communication Revolution" in Kolkatta's ITC Sonar from 16-18th Dec, 2016. The conference was attended by a galaxy of almost 200 distinguished and eminent delegates representing some of the top most corporate leaders, professionals as well as academicians. On the occasion, a talk was delivered by Dr. Tanushri Mukherjee, Assistant Professor, Amity School of Communication in the session, "PR Research". The speaker highlighted on the growing need of research in the PR profession as well as the various areas of research in the field. She also gave an insight on the topic of her Ph.D Thesis. Dr. Tanushri Mukherjee was also felicitated on the inaugural day for her Ph.D in Public Relations by Dr. Chandan Mitra, Editor & Managing Director of the Pioneer, Shri Swami Vedatitananda, Correspondent of Ramakrishna Mission Shilpamandira, Belur Math, Mrs. M.S. Mazumdar, VP (East), PRSI and Mr. Ajit Pathak, Corporate Communications Manager, Indian Oil Corporation and National President of Public Relations Society of India. Mr. Manoj Sharma, noted academician and the director of Public Relations at Goldmine Advertising, New Delhi visited Amity School of Communication and interacted with students on One day workshop on changing trends in public relations - globalized perceptive" on 19th November 2016. He stressed on how social media is becoming a game changer in public relation in global scenario. He also pointed out negative publicity on social media is turning out positive in image building. He took examples of Donad J trump and demonetization policy of Narendra Modi. He also discussed new dimensions and concepts of Public Relations. ASCO let their student to take the class room learning in the ground. Subject of fifth semester Event Management is helping student to implement the theory into practical. On 23rd of November the student of fifth semester conducted a Carnival as a part of their internal assessment. This helped students to learn the basics of Events and how it is carried out in field. This carnival included many stalls of games which was named as jackpot, hit the bull’s eye, hit the can, 7ups and down, burst the balloon , mini militia etc. Inaugurated by Dean of Student Welfare Mr. Maj Gen C.P. Singh and ASCO Director Prof (Dr.) Manish Verma, the event attracted students from other department at the venue Amphi Theatre Lawn. Student of BJ&MC V Semester conducted this event in very planned manner, for promotion of this event they reach out to different social media platform like Instagram, Facebook, Snapchat etc. the follower count on Instagram was reported close to 1.6k. The students shed their blood to make it possible and promote the event. 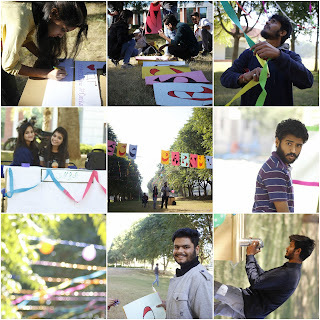 Not just the students but the faculty members from the campus also took part in it. Especially at the Photo Booth where one can get their photo clicked and edited. Attractive Props were provided by the Photo Booth. The event grabbed the attention and created an experience. Students of ASCO,AUR, got a chance to enhance their theoretical skills in the practical life. The students visited Rajasthan Patrika on November 21,2016 . The students reached the organization late morning and were warmly welcomed by the respective officials there. The students were Introduced to various Employees and also their work allowed to them. They got a chance to look into the Radio Station Room. The students were explained about the working of Radio Station of Rajasthan Patrika which is known as "Tadka". The students were also lucky to experience a live radio telecasting performed by the Radio Jockey. Students then had some light refreshments and departed from the organization late in the afternoon. This was a one of a kind experience by the students as they tried to convert their theoretical knowledge into practical and professional experience. The students of Amity University,Jaipur visited the Printing press of Dainik Bhaskar late in the afternoon on the 21st November ,2016. The students were warmly welcomed by the Officials designated at the organization. There was a friendly environment in the press where the students were given a chance to have a look at the Printing process of the daily newspapers. They were shown the hardware , machinery and various other non technical assets of the press. Statistical Report of daily newspaper production was also provided by the Official.